While I'm unsure what you are doing, did you try the free Virtual Router from say this link? I've used it before and it did what I needed. Hi rproffiit, i hate something called virtual router, this software always crash before it even start, i tried it on other computers too 'm just trying to turn DHCP ON, instead of off as shown in the picture..
@m. Sorry but if you can't fix that then time to replace it. I've used the Virtual Router for too many years so it's one of my go to solutions. Thank's mate i will wait if someone has solution for this ..
@m. I have 2 Windows tablets here. A 10 and 8.1. But you are not telling all such as I'm new to Windows and not sure about how to configure my WiFi connection. I see 2 more buttons on your picture so what if this is not you creating a virtual hot spot but just new to setting up Windows? I can't tell from your posts so far. Click the properties button, highlight 'Internet Protocol Version 4 (TCP/IPv4)', then click Properties. 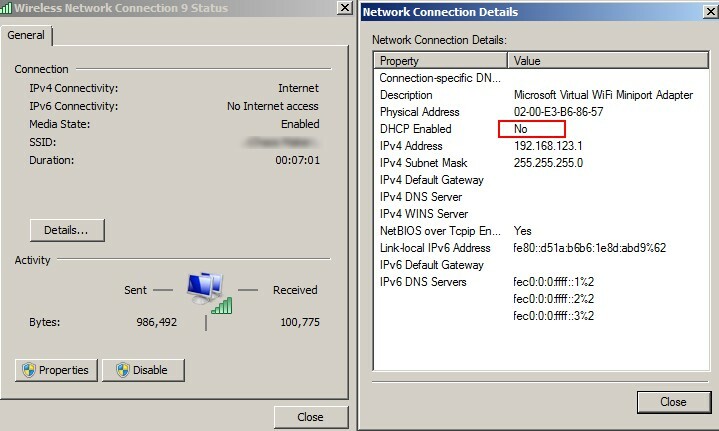 Make sure that 'Obtain an IP address automatically' is selected. thank's guys for your answears, i unistalled the driver and reinstall it and the problem was solved ..